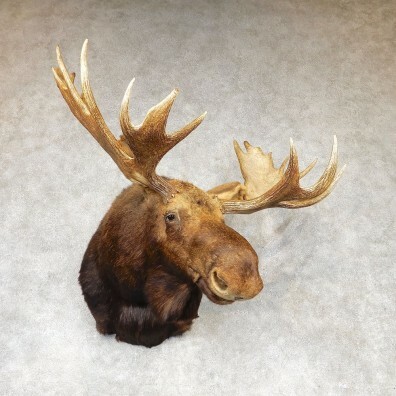 This is a fantastic Western Canada Moose taxidermy shoulder mount, posed with the head in a semi-upright position and looking to the viewers right out into the room. This piece features a great set of antlers with a spread of 51". The hide itself is in really nice condition as well and features thick hair. All this combined with expert quality taxidermy earns this item our Premier™ overall quality rating. All applicable dimensions are included to help ensure this item will fit within your intended display space. - The item will hang on a properly anchored bolt screw. Moose are by far the largest deer species, and the males are famous and instantly recognized for their gigantic, sprawling antlers. Both the males and females sport a muzzle-like face that hangs over their mouth and a "bell" of skin which hangs from their neck. The moose's primary habitat is Canada, though the massive herbavores can be found sparsely throughout the northern United States in states such as Michigan, Minnesota, Montana and Maine as well as in Alaska (the Alaskan Moose).